The parish of Sustead is situated in the north Norfolk. It lies north of Hanworth and Aldborough, west of Roughton, south of Gresham and Felbrigg and east of Matlask. The name Stratton may derive from the Old English meaning ‘southern place’. The parish has a long history and was well established by the time of the Norman Conquest. Its population, land ownership and productive resources were detailed in the Domesday Book of 1086. This document revealed that Roger Bigot held the parish lands after the Conquest and that there was a functioning mill. Aerial photographs of the parish show the cropmarks of a number of prehistoric features. These include a possible trackway (NHER 38482) and ditched enclosures (NHER 38658 and 38660) of unspecified prehistoric date. However, by far the most numerous monuments defined by these photographs are ring ditches (e.g. NGER 12184, 31748 and 36432) and round barrows (e.g. NHER 12848 and 38581). These Bronze Age sites are clustered across the parish, with the ritual significance of the prehistoric landscape illustrated by the presence of a nucleated round barrow cemetery (NHER 38580) on a spur of land overlooking tributaries of Scarrow Beck. The sheer number of these potential Bronze Age features indicates that Sustead was an important ceremonial centre at this time. A diverse collection of prehistoric artefacts has been recovered from Sustead. These include various Neolithic axeheads (NHER 6589 and 6590) and a collection of amber beads (NHER 6597), with complete and fragmentary examples. Two Bronze Age copper alloy daggers (NHER 28252 and 40483) are also on record. Silver coins (NHER 28252) comprise the only Iron Age sites or finds to be recorded for Sustead. One such coin was identified as an example minted by the Iceni Tribe (NHER 39540). Rather more evidence exists for activity in the parish during the Roman era. Cropmarks with a playing-card shaped corner, identified to the northeast of Glen Farm House, may indicate the presence of a military marching camp in Sustead (NHER 13077). It is also possible that a series of rectilinear enclosures and a trackway (NHER 36435) noted in the area immediately to the south of the church (NHER 12327) are of Roman date. Additionally, metal detecting and fieldwalking have unearthed various Roman objects including coins (NHER 6595 and 19647), pottery sherds (e.g. NHER 6755), a quern (NHER 17999), a stylus (NHER 39535) and a bow-and-fantail brooch (NHER 49832). There is a paucity of evidence for Saxon Sustead. 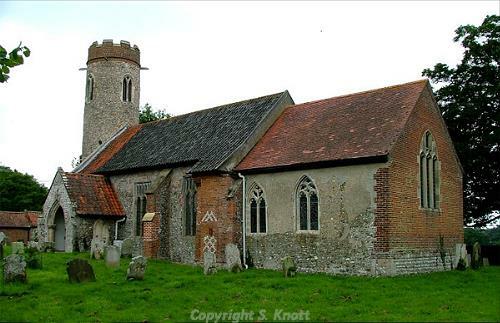 Both St Peter’s and St Paul’s Church in Sustead (NHER 6641) and St Mary’s in Bessingham (NHER 6596) have round towers. As such it is possible that they date to the Late Saxon period, but this notion is far from certain. Similarly, there are few Saxon artefacts to study, with a few coins (NHER 49832), a Late Saxon strap distributor (NHER 40480), Early Saxon bridle bit (NHER 39535) and a beautiful Late Saxon strap end (NHER 39535) among the few objects to have been discovered. The modern parish of Sustead incorporates three villages: Sustead, Bessingham and Metton – and each of these has a parish church of medieval origin. St Peter’s and St Paul’s in Sustead (NHER 6641) is largely in the Decorated style. The south porch entrance has crown-like decoration above it and inside there is a double piscina and large sedilia that apparently was never completed. St Mary’s in Bessingham (NHER 6596) has an 11th century nave, but a 15th century chancel featuring Perpendicular windows. However, much of the external fabric of this church is the result of restorations undertaken in 1869. Lastly, St Andrew’s in Metton (NHER 6642) shows early Norman origins, with traces of a removed central tower. Much of this church dates to around 1300, but the nave roof and north porch are 19th and 20th century additions respectively. The location of the medieval Sustead Hall is uncertain. Late 18th century sources place it on the banks of a stream running to Hanworth Park (NHER 13240). However, the only remains on site comprise a long boundary wall and a few stones. Another interpretation is that Tudor House (NHER 12106), a late 16th century farmhouse, was once the medieval Hall but in fact it seems more likely that it was an outbuilding of the vanished Hall. Alternatively, a moated enclosure with various ditches, remnant watercourses and pieces of flint walling has been suggested as the medieval Hall. A study of local sources indicates that this was more likely to be the manorial site of the Dann family who were mentioned in the famous Paston letters. The last possibility, is that the current ‘Old Sustead Hall’ (NHER 12328) was built on the site of the former medieval Hall. The possible site of a separate medieval Hall, known as Ufford’s Hall, has been identified from aerial photographs (NHER 38618). It lies to the south of Hall Farm (NHER 6760) and is surrounded by the earthworks of a number of ancillary structures including possible fishponds. Both the moat itself and the fishponds are indicative of a high-status medieval settlement which, given its location close to church, may indicate a manorial site. A large number of medieval metalwork objects, coins and pottery sherds have been recovered from Sustead. Finds of note include a figurine of Christ (NHER 21789), a lead pilgrim’s ampulla (NHER 39540), a coin weight (NHER 41117) and a remarkable mount from a medieval mazer – a hardwood drinking bowl (NHER 39535). In the post medieval period, the parish of Sustead was involved in lime burning and brick manufacturing. The sites of three lime kilns have been identified (NHER 15419, 16699 and 18508), with one situated in the grounds of Bessingham Park. The brickworks (NHER 12336) are situated near to the border with Gresham and were once of quite some size. However, a visit to the area in 1977 showed that a single 19th century cottage constituted the only standing structure associated with the brickworks. A number of impressive buildings in Sustead parish were built at this point in time. Bessingham Manor House (NHER 12321) dates to around 1870 and is in imitation Jacobean style with ornate shaped gables and strapwork balustrades. The remains of a dovecote or garden folly (NHER 12324) have also been found nearby. This takes the form of a round tower with a brick base, and this structure would likely have been associated with the present Manor House, and thus dates to around 1870. It is worth noting that the Old Bessingham Manor House (NHER 12322) burnt down soon after the present one was completed in 1870. The brick and flint foundations remain, suggesting a 17th century house, perhaps T-shaped. The arched cellar also remains, but the area is now largely overgrown. Sustead Old Hall (NHER 12328) was also constructed in the post medieval era. It is made from flint and brick and is of 17th century date. The north facade collapsed in 1888 and was rebuilt, although a number of original windows survive. The north front has a Sun fire insurance plaque and the south has a Royal Exchange one. However, the building is of particular interest due to its brick-built Tudor drain. Other buildings worth a look include the Vicarage (NHER 12327), dating to around 1600 with its stepped gables and chequered brickwork, and Hall Farmhouse (NHER 40656) which dates to the 18th/19th century and incorporating several massive medieval timbers internally. The majority of the post medieval artefacts are typical everyday items. The selection that have been recovered include book hinges (NHER 28252), a fob seal with floral decoration (NHER 39535), a weight (NHER 39535), candlestick holder and walking stick ferrule (both NHER 39540). In addition to these objects various coins (NHER 40478) and pottery sherds (e.g. NHER 17998) have been retrieved. The most recent record for Sustead concerns a World War Two searchlight battery (NHER 29531). Aerial photographs taken in 1946 show its location some 500m due north of Sustead Old Hall (NHER 12328). Despite the fact that the site has been ploughed, slight undulations relating to the battery are still evident. Thomas Sunley (NLA) 10 July 2007.